Tom and I went to Duns Kirk this morning for the primary school service. I didn’t like to take a picture of the service (although lots of the parents were) so I took this picture as everyone was leaving. 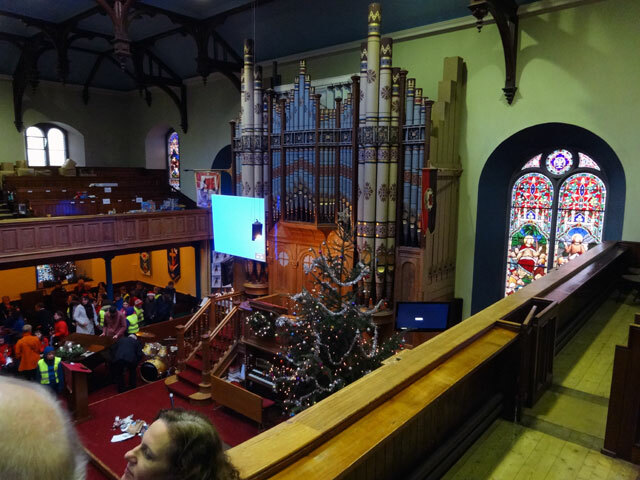 I had never been inside the Church before and I was struck by the size of the worship area, by the dominance of the most impressive organ – and by the beautiful Christmas tree! Well, we had another interrupted night during which Rachel caught three mice and put them in a box (all fitted out with sawdust and food) to see them through until morning when they could be released in the forest. And then, just when I was hoping to get some really good sleep, the fire alarm went off: Rachel had left one of her famous Christmas candles burning. No harm had been done, but I certainly have sleep on which to catch up. Showered and walked Mix before being picked up by Tom and together we went to the children’s service at Duns Church. I enjoyed it very much and afterwards I drove to visit Helen and to get a further briefing (and three boxes of papers) about the task I am to take on for the Presbytery in January. When I got home David was here and he has started work on installing a computer and telephone link to the Bothy. We had coffee and then I started getting ready for a Skype call about Green Pilgrimage. Tom arrived and we put the world to rights and then when he went off to prepare tea at The Old Manse in Gavinton, I had a splendid conversation regarding our Green Pilgrimage plans.